Do they plumb the depths? In my experience the loudspeaker is the single most important choice when putting together a satisfying music reproduction system. The loudspeaker is very room dependent and also depends on the position in the room, get this wrong and it does not matter how good the rest of the system is you will not be able to extract the best from your system. Not only is the loudspeaker important from the sound quality perspective it is also extremely important from the cosmetic point of view, they need to match the decor of the room. 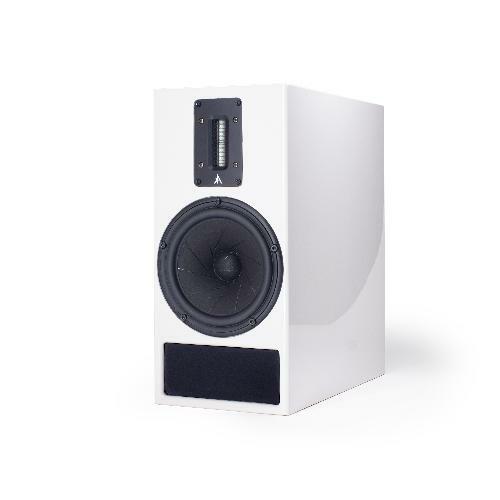 The Kerr Acoustic K300 speakers we have here for review are a relatively small size transmission line stand mount speaker and are available in any of the RAL colours. Matching these speakers to your colour scheme should not be a problem in most situations. The drivers are a Fountek ribbon tweeter with a Scanspeak for the bass/mid duties. The bass uses a shortened and loaded transmission line. The crossover is second order 12dB/Octave and the sensitivity is 89dB/W which is above average for a speaker of this type and size. A good 50W per channel solid state amplifier should be adequate. During my review I used a 500W Emotiva amplifier to start with moving on to a Leak Stereo 50 (25W/Channel) and finishing with an IQAudio DigiAmp+ (35W/Channel) and at no point did I feel any of the amplifiers were not powerful enough. The K300s were supplied with stands for the review as I had nothing suitable. The stands are spiked and supported K300s as well as looking good. I positioned the K300s as usual in my room firing directly at the seating position and placed about a third of the way in from the side walls. They were also about 1.5m from the rear wall, I cannot place them much closer to the rear wall because of the dormer window and roofline that you can see in the first picture. 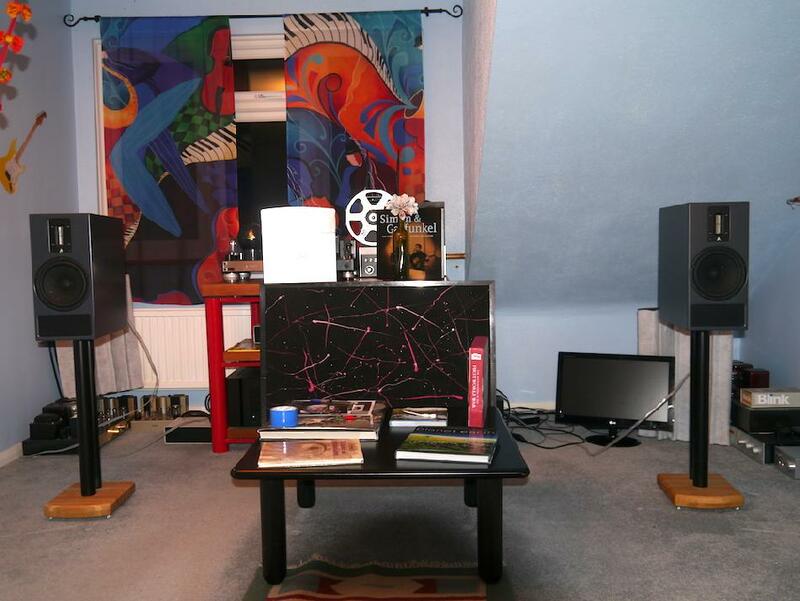 The K300s worked well as placed but as Kerr Acoustic are only a few miles from my house I invited Jes over to take a listen to ensure his speakers were operating at their best. Jes changed the speaker position and tow-in so they were about 75cm from the side walls and firing almost straight down the room. This position change really helped, the ribbon tweeters had been sounding a bit forceful and the tow-in change really helped to balance the sound. Placing the K300s slightly wider apart opened up the soundstage giving greater scale and depth. Now the speakers had been optimally positioned in my room and after a few hours of burn-in the serious listening began. Recently I have been listening to "The Jazz Groove" internat radio station (78kbs), the sound quality of his stream is remarkably good even with the low data rate. The K300s deliver a wide and spacious sound with very good resolution from the low data rate stream. The bass is deep and controlled, in the past I have heard transmission line speakers that were over the top and bloated. In my room the K300s were perfectly balance with good resolution and timing. Turning up the data rate some what via Diana Krall and the album "Turn up the Quiet", the K300s easily reveal the improved quality. Diana's voice is presented beautifully centre stage, with a natural and realistic breathiness. The Fountek ribbon tweeter is something special delivering fabulous detail without being agressive or harsh, something I have heard with other speakers using ribbon tweeters. Moving on to Gregory Porter and the title track from his hit album "Liquid Spirit" the bass extension from the transmission line let the double bass really shine, it was like a spotlight had been turned on the bass player and they had equal billing alongside Gregory. Next up on the play list are The Tallis Scholars and the Allegri Miserere, a fabulous recording with an expansive soundstage that some speakers just seem to gloss over. The K300s managed to deliver a very respectable rendition, getting very close to speakers costing much more. This recording has huge depth to the soundstage which is where many speakers fail and the K300s only start to get a bit vague when the voices are a long way back of the venue. This sounds like I am being very critical, actually this is a complement as this is difficult recording to deliver well. K300 in black, please note the attenuator switch for the tweeter. In order to explore the capabilities of the K300s I turned to vinyl and Elton John's second album "Elton John" from 1970. Considering this album is nearly 50 years old the recording quality is amazing and the K300s let this quality shine through in spite of the rather noisy background from my copy of the album. Compared to modern recordings this album sounds like it was produced simply so you hear all the musicians in their place in the studio and Elton's voice with wonderful tonality and detail. This simplicity worked well with the K300s and they delivered a very realistic performance with good timing, the transmission line did not get in the way of delivering the tune. To finish off I switched to my Leak Stereo 50 power amplifier, Revox A77 reel to real tape deck and a sampler tape from Analogy Records. The recording quality is in a different league to anything digital, it is like vinyl without the background noise and is a great test for any system whatever the price. With this new front end to the system the K300s stepped up and delivered the goods, the high frequencies were smooth and detailed in a way you just cannot get with a digital source. Analogue tape is still a relatively new source for me and every time it just amazes me. While the K300s are comparatively inexpensive, they do not mask the music delivering a thoroughly enjoyable experience. I cannot easily put into words how good analogue tape is, music seems to break free from the replay system and transport you to the recording venue and the K300s deliver a fabulous peformance. The analogue recording has a better dynamic range, fabulous detail, with excellent rhythm and timing, the K300s letting this all through. I would love to hear the larger and more expensive models from Kerr Acoustic with the analogue tape front end, it should stunning. Over the years of my journey with music reproduction I have preferred speakers of a smaller scale. My listening rooms have never been large and a speaker that dominates the room visually has usually got in the way of the music, probably because there is not enough room to let the speaker breath. Because on my preference for smaller speakers bass perfomance has always been a compromise, a good example was when my regular speaker was the classic LS3 5a. The Kerr Acoustic is a different beast to the venerable LS3/5a with a more modern presentation, more dynamics, yet retaining a lot of the neutrality of the LS3 5a. Where the K300s really excel is bandwidth, the bass is no longer such a compromise, and the ribbon tweeter is so good with lots of detail without being harsh. To get the best from the Kerr Acoustic K300s you do need to spend time getting them positioned correctly as I discovered. To my ears, in my room, a valve amplifier delivered the best results with the ribbon tweeter sounding sweet and smooth with fabulous detail. Using a solid state amplifier is still fine, just don't compromise on quality as this could compromise the K300s. What is your background, in terms of speaker design? In the beginning, it was very much “learning through doing”. I've had a keen fascination for loudspeakers from a very early age, fuelled by a love of music. Being surrounded by live music since birth, I became fascinated with the concept of reproducing it as accurately as convincingly as possible. I built my first (mono) speaker together with my father around age 8. From then on, it was a case of pleading with my parents each weekend to go to various local car-boot sales to collect as many “junk” speakers as possible, taking them home, dismantling them and making various “Frankenstein” speakers out of the components. The advent of the internet made it far easier to access information, which helped to underpin and substantiate the knowledge I had gained through experience. Through my early/mid teens, I began experimenting with different types of bass enclosures, ranging from reflex, infinite baffle, and various band-pass designs - learning all the time through trial and error. I used these to reinforce the mediocre bass response from my low-budget system. It wasn't until my late teens that I began collecting more serious speaker systems (from the likes of Infinity, Cerwin Vega, Rogers, Mordant-short, Sony APMs etc). In many cases, I found I was able to improve the performance of these speakers through subtle crossover modification, reinforcing the internal cabling and cabinet bracing, modifying the internal absorptive material, etc. It wasn't until my degree dissertation that I attempted a transmission line - a large 3-way design featuring a 12” woofer - essentially an early predecessor to the K100. I studied, in great depth, the writing of Martin J. King and John Risch, which gave me a solid grounding in understanding TL technology and it's implementation. When did you start Kerr Acoustics, and why? Kerr Acoustic was launched officially in June 2017, following 18 months of product R&D and market research. I started the company because I identified a gap in the market for a high-end transmission-line speaker featuring premium quality materials and components, incorporating a cutting-edge planar tweeter. While there are undoubtably some very effective transmission-line speakers on the market, I felt that the benefits of TL loading could be taken a step further through the implementation of superior cabinet materials, advanced driver technologies, and a more fastidious approach to design methodology and construction. Early prototypes proved that the concept worked, and following positive feedback and encouragement from various industry professionals, I believed that there was commercial potential for my designs. Now, another 18 months in, we're selling them through a number of dealers, and as far afield as Hong Kong. Where do the cabinets come from, and what materials are used in them? Our cabinets are produced entirely in-house by a 2-man team, crafted by hand using routers and jigs - without the use of any CNC machining or automated processes. We exclusively use a combination of 18mm and 24mm Baltic Birch plywood, for it's numerous beneficial structural and acoustical properties (namely, 90 degree alternating cross-grain composition, infinitely varying natural wood grain structure, and damping resin between each 1mm plywood layer), all of which greatly helps to reduce resonance and mechanical energy transfer. As a material, it is a great deal more costly than MDF and significantly more difficult to machine. In particular, the resin layers between each “ply” make it particularly tough on our saw blades, which we have to have sharpened regularly to maintain clean cuts! However, I believe the structural and sonic benefits fully justify this extra cost and work - producing cabinets which are extremely non-resonant and acoustically inert. Where do the drivers come from, and what are the exact make and model? How complex is the crossover, and how many elements to it? The 6-element 2nd order (12dB/ octave) crossover is a simple affair of very high quality and carefully selected components, which are individually measured, pair-matched, and hand-soldered using point-to-point wiring. We exclusively use unique air-core inductors (hand-wound in-house), polypropylene film capacitors, and carbon film resistors. Despite the simplicity of the design, the crossovers took by far the most time to optimise and fine-tune. It was not only essential to ensure they performed well sonically, but they also had to perform well electrically, presenting an even impedance load to the amplifier. A great deal of care and attention to detail was employed to fully optimise these circuits, with emphasis placed on them being sonically transparent and a low-loss as possible. Why choose a TL? What the benefits, and the downsides of this approach? Once I had experienced the true benefits of a well-implemented transmission line, it became very difficult to consider using other methodologies for cabinet construction. More extension and a much more gradual roll-off in the low-frequency end of the spectrum, compared to ported / sealed cabinet designs. Bass response is also perceived as “faster” and better controlled than alternative cabinet designs, with bass notes starting and stopping with more precision and accuracy. Significant reduction in distortion, owing to the rear waveguide channeling the unwanted rearward energy away from the cone. In the majority of sealed & ported designs, the unwanted rearward energy often resonates and reflects inside the hollow cavity behind the driver, which can introduce distortion and non-linear behaviour, making it very hard for the cone to function optimally. This is particularly the case in 2-way designs, where a single bi-polar driver has the responsibility of covering a very wide bandwidth of information. Incorporating a carefully damped rear waveguide means that the cone isn't fighting against reflections inside the cabinet, and by the time the drivers' rear energy reaches the terminus of the transmission line, all content above around 80Hz has been absorbed and internally dissipated by the dampening materials. The result is a significant reduction in distortion, and a much more transparent, cleaner, and more natural sounding midrange. Additional internal cabinet bracing - a very welcome benefit from the internal waveguide. This in turn helps to reduce unwanted cabinet resonance and colouration. Typically, TL loading requires a physically larger cabinet than sealed / reflex designs, to function optimally. In the mainstream, people's ears are typically calibrated to the high-Q bass output from reflex enclosures. Hence on first listen, our TL's can sometimes be perceived as sounding somewhat bass-light in rooms with significant axial room modes that don't have some degree of acoustic treatment. Our speakers don't “flood” the room with a wash of exaggerated 40-80Hz content, as a lot of reflex designs do, and hence are somewhat more sensitive to boundary conditions than more conventional designs. However, in a correctly optimised room, the advantages in bass performance are obvious. In non-optimal spaces, bass output can be somewhat optimised by experimenting with rear boundary proximity. Why not bass reflex loading like everyone else? While reflex loading can give a fairly instantly-satisfying “cushioned” bass response, it is rarely accurate and often contains a lot of non-linearity. A reflex port performs very effectively over a narrow band, but falls down outside of this band, often making it very hard to achieve low bass without significant internal cabinet volume. In my experience, reflex enclosures tend to sound “slower” and more “ploddy” in the bass. Moreover, they impart a stronger “one-note” sonic signature, making it harder to distinguish individual low frequency characteristics in the source material, owing to cabinet and port-induced colouration. Transmission lines make it easier to identify and distinguish the detail and nuances in individual instruments in the lower octaves - take double bass and tympani playing together for example - with a reflex enclosure, these sounds are more likely to merge together, with the cabinet and port's natural resonance being excited and colouring / smearing the presentation. Of course, this is just a general rule, and based on personal experience. What sort of sound were you aiming for? Being originally designed for professional studio application, the primary design objective was to produce a fast, accurate, and neutral loudspeaker. Great emphasis was placed on optimising the response in the time domain, which I believe to be of equal (and in some situations, greater) importance than amplitude / frequency response. This is one of the main reasons I opted for an incredibly light tweeter diaphragm (0.027g, compared to ~0.5g for a conventional dome and ~0.17g for an AMT-style ribbon tweeter). This incredibly low-moving mass enables unparalleled response in the time domain, with an remarkable ability to respond to transient information effectively, particularly during dense program material where the tweeter is having to reproduce a wide band of information simultaneously. Our speakers do not flatter or compliment the source material, and resultantly, people are often surprised by how drastically different their recordings sound from one another, owing to the speakers importing very little of their own sonic signature. Do you know of any other TLs that use ribbon tweeters? I believe that IPL offer DIY speaker TL kits, that include ribbon tweeters. I don't know of any other company that combines these design features together. What is your favourite speaker, not designed by you? A tough question, but I do have a soft spot for my trusty Infinity RS 9 Kappas. A hideously complex and woefully impractical loudspeaker, but one which offers remarkable performance when fully optimised and driven appropriately. The infinite-baffle 7-driver 5-and-a-half-way design presents a particularly evil impedance load to the amplifier (dipping as low a 0.3 ohms in places! ), and practically requires an arc-welder to drive them effectively. However, they have been my reference loudspeakers for the last 8 years due to their ability to reproduce program material with a remarkable sense of scale and detail. 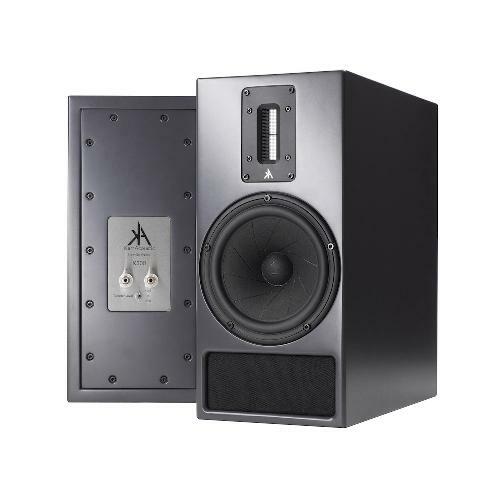 They combine a number of desirable design characteristics - including sealed cabinets, very light injection-moulded-graphite 12” woofer cones, well-designed midrange domes, and planar tweeters. They also function as a di-pole above around 800Hz, and image fantastically - not just in terms of breadth and depth, but also height - something that I think a lot of speakers miss. DISCLAIMER. TNT-Audio is a 100% independent magazine that neither accepts advertising from companies nor requires readers to register or pay for subscriptions. After publication of reviews, the authors do not retain samples other than on long-term loan for further evaluation or comparison with later-received gear. Hence, all contents are written free of any “editorial” or “advertising” influence, and all reviews in this publication, positive or negative, reflect the independent opinions of their respective authors. TNT-Audio will publish all manufacturer responses, subject to the reviewer's right to reply in turn.